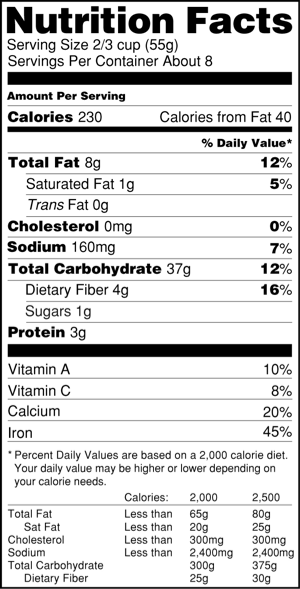 Changes to nutrition labels on food packaging are in motion, and the industry will pay upfront. The new labels will require businesses to re-print, redesign and redistribute the new labels at their own cost. The federal government is overhauling nutrition labels in light of public health research that reveals what is lacking in the country’s diet. The changes, spearheaded by the Obama administration and proposed by the Food and Drug Administration in February, are aimed at making healthy eating easier for the consumer. Using a cost-benefit analysis, the FDA calculated a return of more than $20 billion over the next 20 years in the form of decreased health care costs. That makes the upfront costs of $2.3 billion to the food industry worthwhile, FDA officials say. Obesity and related diseases are the greatest threat to healthcare costs. 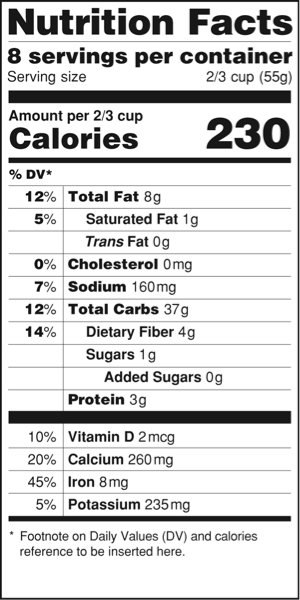 Pending changes on the labeling side panel include emphasizing calories, changing serving sizes and requiring the amount of nutrients like potassium, vitamin D and added sugars to be listed on the label. These companies will have to pay for new printing, graphic design and nutrient analyses of their products. Inventory costs exist as well because packaging with old labels cannot be sold after the changes are enforced. “It’s a necessary evil,” Seiffert said. With the huge upfront costs to the food industry, it remains to be seen whether the changes will have an impact on consumer habits. Litchfield said only about one half of the public reads nutrition labels. This leads to the underlying question: If changes are made, will the consumer even notice? Some will and some won’t. The FDA found the number of people who read labels has increased from 44 to 54 percent in the last 10 years. Yet, the question remains – will the costs that businesses pay for the new labeling translate into a more health-conscious public, or is there a better way that will yield greater result? People in the health field can look at the label and understand what it means, but the average consumer might not know how much sodium makes a product high in sodium, Litchfield said. Consumer education is important. Past experience offers insight about the effectiveness of labels. Following the inclusion of trans fats on the label in 2006, the Center for Disease Control and Prevention cited a significant reduction in trans fat consumption. FDA officials saw this as evidence of the potential beneficial changes when it released the new labels. This is the first major overhaul of the label since its mandate in 1990 by the Nutrition Labeling and Education Act. The proposed changes are up for public comment until June 2, then the FDA will make its final review. Businesses anticipate, as happened in the inclusion of trans fats, that the food industry will have two years to comply before the changes are enforced, giving businesses time to print new labels and sell current inventory. “The current labels have been out for a long time, and these changes have been discussed for years,” said JoAnn Miller, a registered dietician with the University of Iowa. Although some of these recommendations were considered throughout the last 10 years, the FDA took the costs to the food industry into account before making changes. Rather than changing one thing at a time, the FDA will apply all of the new recommendations at a one-time cost to the food industry. Emory University law professor Joanna Shepard-Bailey conducted a 2012 economic analysis of label changes in light of the movement for genetically modified organisms (GMO) labeling in food. She suggests that the costs of changing labels do not outweigh the costs of changing labels do not outweigh the physical and administrative costs of re-pricing. Therefore, she predicts, most companies will absorb the labeling costs and understand it as part of the necessary evil. However, labeling is not the only costs companies will have to absorb. Another expense will be paid toward verifying products for nutrients. With vitamin D and potassium now required to be on the labels, companies must test their products for accurate measurements of these nutrients. The FDA has approved certain database software that provides general nutrient content for certain foods, alleviating the need for companies to send their products out for testing. The databases, are not perfect, but are FDA approved, Seiffert said. The Grocery Manufacturers Association, the world’s largest food industry trade association, has praised the FDA for addressing the changes in consumer preferences over the years as food and beverage companies have already done individually. The association has not commented on whether or not it has received concerns from companies in the food industry about the potential costs of the proposed changes. Jackson Parr is a May 2014 graduating senior at the University of Iowa School of Journalism and Mass Communication. The Food and Drug Administration (FDA) is proposing changes on nutrition labels on food and beverage packaging to bring the information up to date with the latest research and to help people understand what they are eating and drinking. It will take public comment until June 2.